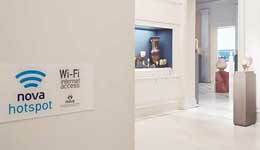 Free and no charge internet access in six buildings of the Benaki Museum is offered to visitors after necessary equipment installation has been completed as well the interconnection with the Nova telecommunications network. This is a major sponsorship of Nova, the largest provider of innovative bundled entertainment and communication services in Greece, as part of its Social Responsibility actions of supporting culture. The Benaki Museum visitor has the opportunity to connect and navigate safely and at high speed with Nova's reliable services, with unlimited access, from all portable devices (mobile phone, laptop, tablet).